We offer the latest in state-of-the-art hair restoration solutions designed specifically to meet your individual and unique needs. By creating 100% customized non-surgical, permanent hair grafts for men suffering from the devastating effects of hair loss, we offer our clients the completely natural look and feel of actual growing hair in whatever style and color they desire. At Tiffany for Men, our hair loss solution is virtually undetectable to both sight and touch because your hair graft is made from the best human and synthetic hair available. Your hair will be created to your exact age-appropriate specifications, based upon your desires and expectations, and customized to your individually unique lifestyle. For men suffering from alopecia, male pattern baldness, and other causes of hair loss, our commitment to the highest professional standards allows us to offer totally customized hair replacement solutions. The result is that your individually customized hair restoration restores your natural appearance as though the hair is growing naturally out of your scalp, with a totally naturally looking hairline, and a completely natural feel to the touch. 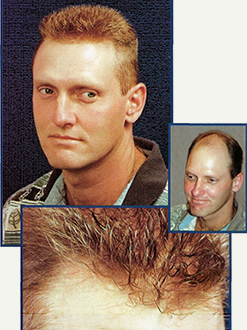 And best of all, you can have the same total coverage of your scalp as you had before you started going bald. No one will ever know that it's not your hair growing out of your own scalp. You can create any hairstyle you wish, including those that are combed back in such a way as to totally expose the front hairline.